Thomas Wolfe didn’t think you can go home again. This weekend, I’m going to find out if he was right. The photo is what I looked like at seventeen, when I lived in Hood River, Oregon, a small town on the south bank of the Columbia River. I spent most of my high school years there, years important to me in so many ways. 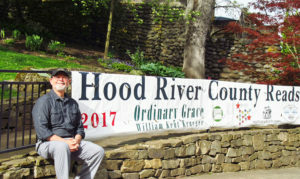 The town folks have chosen my novel Ordinary Grace for their annual Hood River Reads program. On Saturday, Sunday, and Monday I’ll be presenting a writer’s workshop, speaking to the community, and dropping into the schools to talk with students. It’s been a long time since I visited, and I’ve never been back in this way before, returning to discuss my writing, and especially Ordinary Grace, a novel that, in many respects, Hood River helped to shape. I’m looking forward to cruising past the house my family occupied, making a pilgrimage to the place where I first kissed a girl, standing on the football field where I was a terrible quarterback. I hope to be gathering with friends who still call Hood River their home. Although Minnesota is my home now, the place that makes my heart sing, I still think about Hood River all the time. The past is never dead. It’s with us always, alive in our memories. It can still excite us, scare us, thrill us. All that we were a part of, every adolescent antic, can still make us cringe or laugh or cry. Probably, when I’m in Hood River, I’ll experience all these things. When I returned to Hood River, Oregon, where I’d spent some of the most important years of my life, I received the warmest of welcomes. My high school classmates, some of whom I hadn’t seen in nearly fifty years, the committee that had worked so hard to plan the Hood River Reads program, the students in the schools where I spoke, and the crowd who joined me at the library to hear what I had to say about Ordinary Grace, all embraced this prodigal son with an affection that moved me deeply. Hood River is one of the most beautiful places on earth, maybe rivaled only by the beauty in the hearts of the people who continue to call it home.